I have a UICollectionView with a flow layout and each cell is a square. How do I determine the spacing between each cells on each row? I can't seem to find the appropriate settings for this. I see there's a min spacing attributes on the nib file for a collection view, but I set this to 0 and the cells doesn't even stick. Usage: the spacing between items is determined by delegate's collectionView (_:layout:minimumInteritemSpacingForSectionAt:). I put it on github, https://github.com/Coeur/UICollectionViewLeftAlignedLayout, where I actually added a feature of supporting both scroll directions (horizontal and vertical). The "problem" with UICollectionViewFlowLayout is that it applies a justified align to the cells: The first cell in a row is left-aligned, the last cell in a row is right-aligned and all other cells in between are evenly distributed with an equal spacing that's greater than the minimumInteritemSpacing. There are already many great answers to this post that solve this problem by subclassing UICollectionViewFlowLayout. As a result you get a layout that aligns the cells left. Another valid solution to distribute the cells with a constant spacing is to align the cells right. The concept here is to check if the current cell with index i and the previous cell with the index i−1 occupy the same line. If they don't the cell with index i is the left most cell in the line. → Move the cell to the left edge of the collection view (without changing its vertical position). If they do, the cell with index i is not the left most cell in the line. → Get the previous cell's frame (with the index i−1) and move the current cell next to it. ... you do the same vice-versa, i.e. you check the next cell with the index i+1 instead. 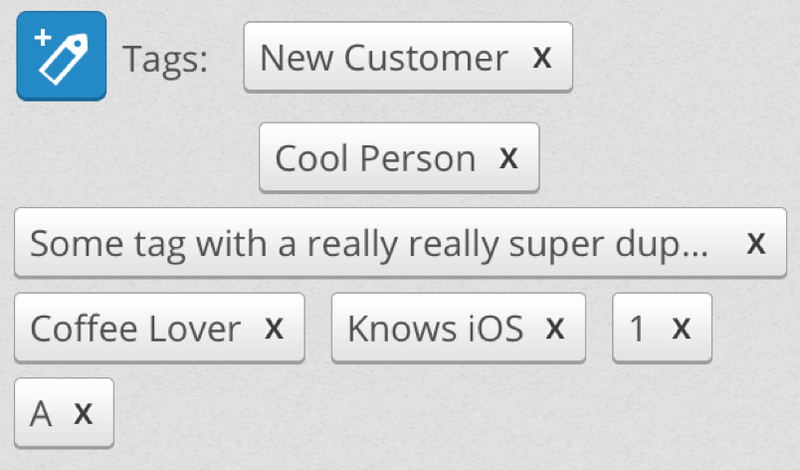 Taking @matt's lead I modified his code to insure that items are ALWAYS left aligned. I found that if an item ended up on a line by itself, it would be centered by the flow layout. I made the following changes to address this issue. This situation would only ever occur if you have cells that vary in width, which could result in a layout like the following. The last line always left aligns due to the behavior of UICollectionViewFlowLayout, the issue lies in items that are by themselves in any line but the last one. With @matt's code I was seeing. In that example we see that cells get centered if they end up on the line by themselves. The code below insures your collection view would look like this. Thanks so much for this! It was incredibly helpful and saved me a ton of time. I was wondering though if you have any advice on how to make this flow horizontally as I am currently putting UICollectionViews in UITableViewCells and the vertical direction is being intercepted (and wouldn't be good ux anyway). Not sure I completely understand what you mean, maybe provide a mockup? 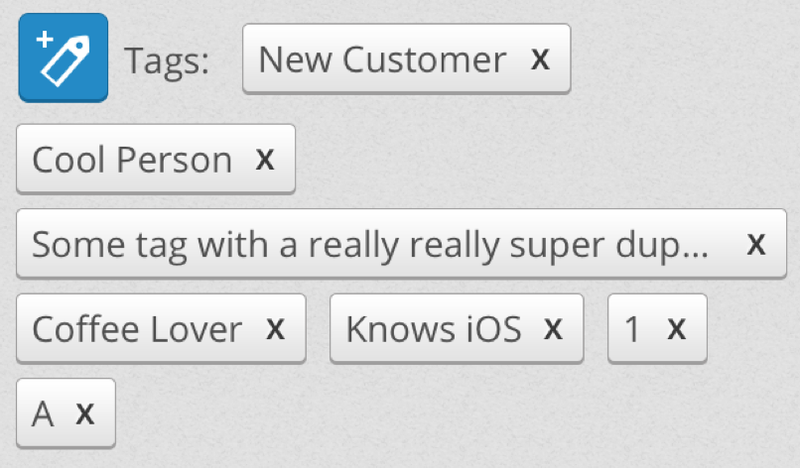 @ChrisWagner Hey, an offtopic, what font have you used for those tags? @ChrisWagner can you provide some details about setting the rows distance? I've changed my kMaxCellSpacing to 3, implemented - (CGSize)collectionView:(UICollectionView *)collectionView layout:(UICollectionViewLayout *)collectionViewLayout sizeForItemAtIndexPath:(NSIndexPath *)indexPath which returns calculated size of tag buttons (yeah, i'm making same thing as at your's screenshot). But, I'm still having trouble with row spacing. When the distance between cells is 3, the distance between rows still about 10. Can you tell me, how I can affect it, please? @kokoko I am not sure why it's not respecting your value, have you tried a negative value to see if it has any affect? Obviously it'd be better to find the root cause but it's worth seeing if it is doing anything. I haven't done any custom collection view layouts since this so I am having a hard time recalling all of the intricacies. Nice! Many thanks to you and @matt for this, it definitely saved me a lot of time, and made me understand what was going on better! Cheers! I found an edge usage case: when the developer uses the delegate to set the insets for the section. To cover that case we need to first ask the delegate, and only in case it doesn't set the insets using the layout class ones. I added an improvement suggestion aswell: add rounding to previousFrameRightPoint or the content of the cells might be blurry. Instead of kMaxCellSpacing you should use self.minimumInterimSpacing. To avoid the significant performance hit on large collections, I think a simple modification to this would be to simply cache the attributes and last indexPath. Then, at the beginning, simply check if [indexPath isEqual:self.cachedIndexPath] and if so, just use the cached attributes. Of course, you also need to update the cache when the attributes are computed otherwise. I've tested this in a sample project, and it seems to work well. I can't think of a scenario that would break this. If you can, please post. 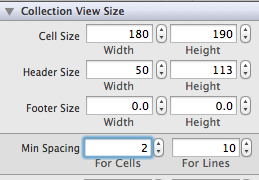 THis would work when cell item width is static. In my situation the previous cell's size is important, which is why it calls for the layout attributes of the previous cell. I didn't performance test it on a large collection view. My use case has at most 11 cells so it was never an issue. 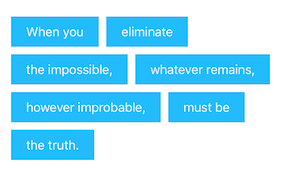 The swift version of Chris solution. This code really helped me out. Thank you so much. Try changing the minimum spacing in IB, but leave the cursor in that field. Notice that Xcode doesn't immediately mark the document as changed. When you click in a different field, though, Xcode does notice that the document is changed and marks it so in the file navigator. So, be sure to tab or click over to a different field after making a change. Save your storyboard/xib file after making a change, and be sure to rebuild the app. It's not hard to miss that step, and then you're left scratching your head wondering why your changes didn't seem to have any effect. UICollectionViewFlowLayout has a minimumInteritemSpacing property, which is what you're setting in IB. But the collection's delegate can also have a method to determine the inter-item spacing. That method trump's the layout's property, so if you implement it in your delegate your layout's property won't be used. Remember that the spacing there is a minimum spacing. The layout will use that number (whether it comes from the property or from the delegate method) as the smallest allowable space, but it may use a larger space if it has space leftover on the line. So if, for example, you set the minimum spacing to 0, you may still see a few pixels between items. If you want more control over exactly how the items are spaced you should probably use a different layout (possibly one of your own creation). Thanks for the awesome answer. I think what I am looking more is the maximumInteritemSpacing, is there such value? No, there isn't a max value. If you think about what the flow layout does, you'll see why. The flow layout puts as many items on a line as can fit while still respecting the minimum item spacing. At that point, there will be n pixels left over, where n is greater than or equal to 0 and less than the size of the next item plus the minimum spacing. The layout then takes those n pixels and distributes them to space the items on the row evenly. It couldn't do that if you set a max spacing. You can, however, write your own layout to space items however you like. +1, You can set minimumInteritemSpacing and minimumLineSpacing as well, depending on what you are trying to achieve. Can you please identify the exact method in the layout's delegate that can determine horizontal inter-item spacing. @Drux Sorry -- poor wording. I'll fix it. There is a UICollectionViewDelegateFlowLayout protocol that the collection view's delegate can adopt to support a flow layout. See the method – collectionView:layout:minimumInteritemSpacingForSectionAtInd‌​ex:. To get a maximum interitem spacing, subclass UICollectionViewFlowLayout and override layoutAttributesForElementsInRect: and layoutAttributesForItemAtIndexPath:. The reason this is so easy is that we aren't really performing the heavy lifting of the layout; we are leveraging the layout work that UICollectionViewFlowLayout has already done for us. It has already decided how many items go in each line; we're just reading those lines and shoving the items together, if you see what I mean. Thanks for the solution. A minor point: the recursion within this code may be expensive if there's a collection view with a large set of horizontal items per row (collectionView.contentSize.width is much larger than cell width). [SOLVED] UICollectionView - distance between cells? How to design inter cell space in UICollectionView? [SOLVED] UICollectionView Max Cell Spacing?